I have seen quite a few washers in my time, and surprisingly I have used them too! However even I was shocked at the style of the LG. 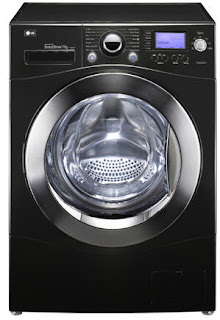 Its sleek, it's got an unfathomably huge drum and door on the front- on a regular sized washing machine. When it arrived, I did have to get the tape measure out, as I wasn't convinced it would fit in the space previously occupied by our old machine. It looks like it should be a lot bigger than it is, but it fitted snugly into the kitchen- its dimensions including top plate are (WxHxD) 600x842x640. Its also light- I obviously had the chance to compare with our old machine when moving one out the way of the other, and could notice a difference straight away. When removed from the box, even those who are new to DIY and home appliances would have no trouble working out the instruction manual, and all the required tools to set it up are included. The inside of the drum has many more water jet outlets than our standard washing machine, due to the "Shower Spray" system it uses. This pumps water from the bottom to the top of the drum when washing, which distributes detergent more thoroughly, and saves on electric usage. It is environmentally friendly too, boasting of a 20 percent energy efficiency rating. It is digital, with a crisp and clear display which is easy to read, and it's clever to boot. No need to programme in if you're only washing one pair of jeans. The machine is that innovative it knows by the weight when you switch it on how much water and power to use. Mum's will love it, as you can load in up to 11kg of washing, meaning less washes need to be loaded and unloaded. Its quiet- you would hardly know it was on at all, as it has a Dampening and Ball balancing system. It hums rather than rattles, and means that washing overnight or once the children are in bed will no longer mean you have to worry about the spin cycle. There are also special wash cycles, which are great for those with sensitive skin- wash programmes include Baby Care, Skin Care and Allergy Care. There are also the usual suspects of cycles too. You can have complete say over the temperature whatever setting you have it on, and the door has a handy child lock feature to keep the tots out! This washing machine is the Ferrari of its kind, it has impressive features, washes incredibly well and efficiently, and looks good in the kitchen too.